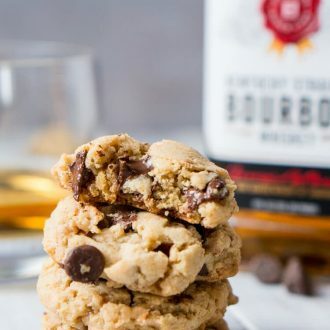 Bourbon Toffee Brown Butter Chocolate Chip Cookies are soft and chewy chocolate chip cookies laced with toffee, bourbon, and nutty brown butter accents. Bourbon. Toffee. Brown Butter. Chocolate. Cookies. the best damn cookie you will ever have! Never have I ever had a brown butter cookie and let me tell you one thing… I’ve been missing out. Who would have thought a simple method of cooking butter could change the very foundation of the cookie as we know it. Nutty, dark, smokey. That’s what brown butter adds to the cookie. Sounds kind of like a bar in the 90’s, huh? But they need something else in order for them to have the full-on neon light ambiance. Bourbon. Oh and a little toffee and chocolate for good measure. 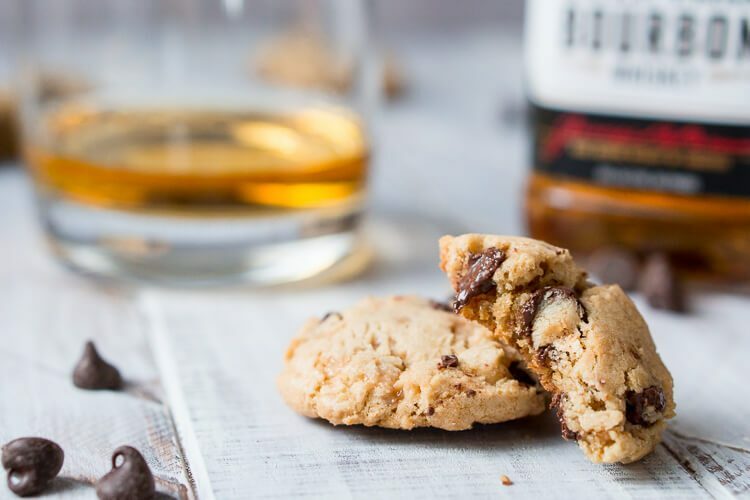 When you take a bite of these cookies you get a little punch of bourbon followed by sweet sugar and chocolate with a finish of salty toffee and nutty notes. They’re incredible, flavorful, and bold! So, go! Be bold! Take a chance on these cookies! I’m pretty excited to be sharing these cookies with my family this Christmas and wanted to get the recipe out in time so you could share it with yours. After all, the holidays are about sharing and family and enjoying the simple things in life, like cookies. For most of us, Christmas means kicking your feet up for a day with a glass of your favorite spirits, playing games, and making memories with your loved ones. That is my Christmas wish for all of you. 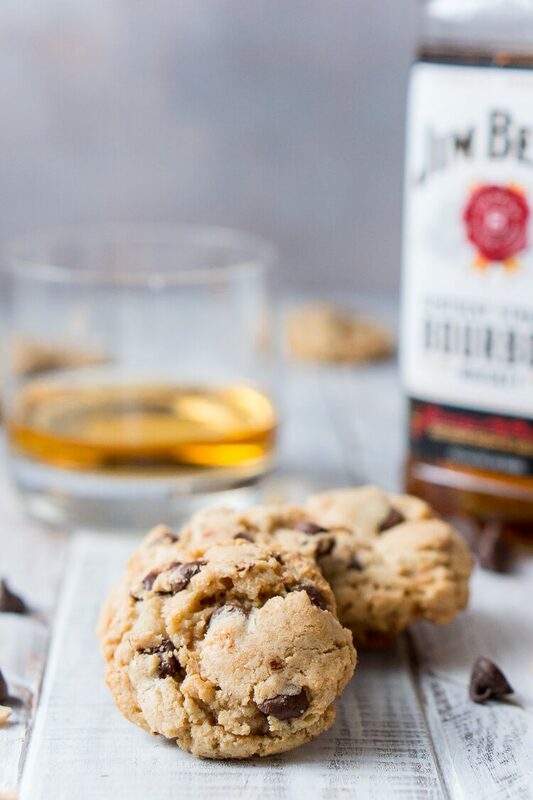 This recipe was inspired by and in honor of my Uncle Jake, for his love of Bourbon and because I can always count on him to bail me out. So here’s to you, Uncle Jake, thank you. 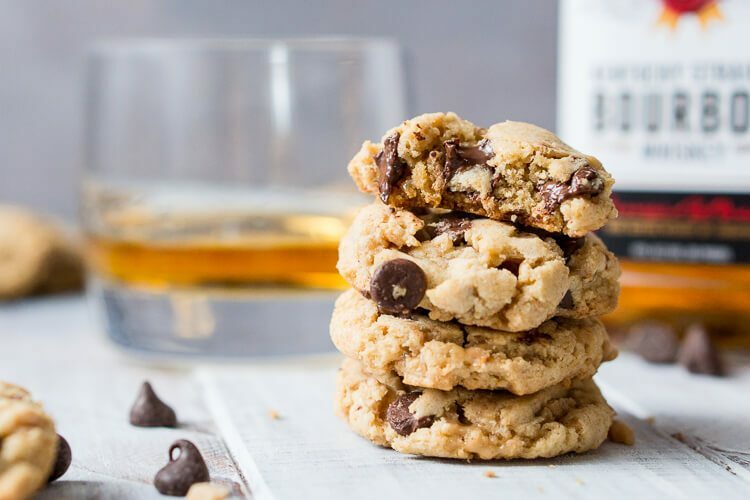 Soft and chewy chocolate chip cookies laced with toffee, bourbon, and nutty brown butter accents. Add the butter to a medium sized skillet and cook over medium heat. Stir continuously, butter will start to boil and foam. Stir for another minute or so until butter starts to brown, pour into a tin container (I used a bread pan). You'll be able to see what looks like amber sand in the bottom of the pan. The whole browning/cooking process took about 10 minutes. Allow butter to cool in fridge for 1 to 2 hours. Then remove from fridge and allow it to soften to room temperature. Mix together the flour, baking soda, baking powder, and salt in a large bowl and set aside. In a stand mixer fitted with a paddle attachment, beat together browned butter and sugars. Mixture will be a bit crumbly. Add in eggs one at a time and mix until combined after each addition. Add vanilla extract and bourbon and mix until smooth, mixture should resemble frosting. Slowly add in flour mixture a half cup at a time and beat until just mixed in. Fold in the chocolate chips and toffee bits. Wrap dough up in plastic wrap and chill for at least 2 hours, preferably overnight. This is absolutely necessary so your cookies aren't hard. 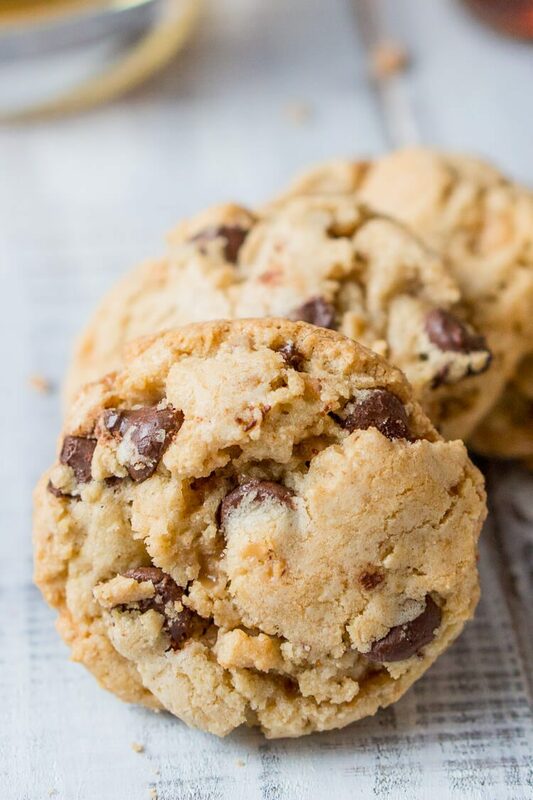 When you're ready to bake cookies, preheat oven to 350 F.
Place rounded tablespoons of cookie dough on a parchment lined baking sheet at least 2 inches apart. Bake for 11-13 minutes until edges are golden brown. 12 was my magic number! Let cookies cool on baking sheet for two minutes before transferring to a cooking rack to cool completely. Originally published December 2013, updated December 2016. Looks like you have a typo in the ingredient list: it should be 2.5 cups of flour, not 3.5 cups. That’s the correct ratio, given you’re using 2 eggs and 2 sticks of butter. Otherwise you end up with really crumbly and dry cookie dough. Nope, the 3.5 cups of flour is accurate. We make the recipe all the time and never had a bad batch! OMG…you are right…I am making this right now without reading comments… there is nothing creamy about my butter sugar mixture! Hi Denise, the mixture should come together for you in a dough, how did they turn out in the end? I made it as listed and turned out perfectly! Noticed it upped the bourbon recently. Was 3 tbsp and now says 1/4 cup … hope they still turn out as well as the three delicious batches I made last month. Hi Megs, it shouldn’t impact the recipe much at all, this holiday season we decided to up the liquor a bit and loved it! But feel free to continue to make them with the 3 tablespoons. What non alcoholic liquid can i use instead? 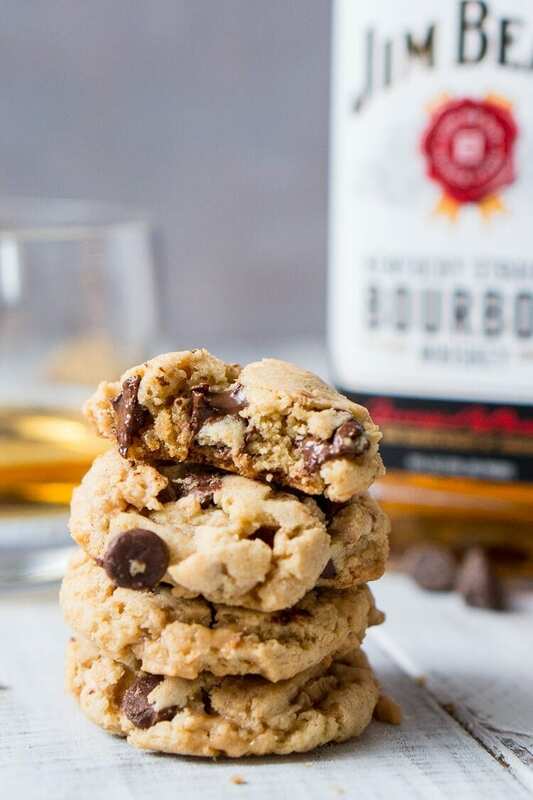 Hi Tina, I’m not sure where I’ve never made them with anything but Bourbon, however, it’s such a small amount that I would say you could replace it with milk to achieve and similar texture. Let me know how they turn out! I think Suma is right, I’ve just made them and the batter is really dry! 1 cup less of flour would be better. Hi Stephanie, I’m sorry these didn’t turn out for you, they definitely shouldn’t be flat. Is it possible your leavening agent was expired?